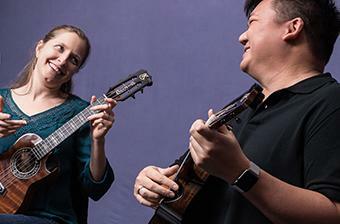 Craig Chee and Sarah Maisel have poured a wealth of musical knowledge into their Ukulele lessons online. Students in the Ukulele classes have unlimited access to video lessons, backing tracks, ukulele tablature, and more. Learn from world-renowned Ukulele masters. What ultimately sets these ukulele lessons apart from other offerings is the ability to submit a video for review using the ArtistWorks Video Exchange Learning® platform. Craig and Sarah review each submission and records a video response, offering specific guidance to take your uke playing to the next level. All students can access the Video Exchange library and watch each other’s interactions with Craig and Sarah. This library is constantly expanding and may contain the key to unlock your playing. Craig Chee is a world-renowned instructor and performer who infuses his energetic and just plain "fun" style into many genres of music. He's known for his collaborations at different music events. Craig is passionate about crafting the best ukulele lessons online at ArtistWorks and teaches beginner ukulele lessons to advanced. Sarah Maisel discovered ukulele while attending college. Studying under Frank Leong, Sarah dove into the jazz stylings of golden age Hawai'i songs and arrangements inspired by ukulele legends like Lyle Ritz, Benny Chong and Byron Yasui. Sarah found a passion of teaching and performing with ukulele and was quickly featured at many ukulele festivals around the world. Straps: To Strap or Not to Strap? The Jake Roll - "Europa"
“Haole Hula” - Version 2 -NEW! “House of the Rising Sun” - Version 2 -NEW! “Haole Hula” - Version 3 -NEW! Chord Melody - “Happy Birthday” -NEW! Chord Melody - “Haole Hula” -NEW! Chord Melody - “House of the Rising Sun” -NEW! Advanced Comping - “In A Sentimental Mood” -NEW! Advanced Comping - “Fly Me to the Moon” -NEW! Advanced Chord Melody - “In Your Hawaiian Way” -NEW! Advanced Chord Melody - “Haole Hula” -NEW! Advanced Chord Melody - “In a Sentimental Mood” -NEW! Advanced Chord Melody - “Avalon” -NEW! Advanced Chord Melody - “Fly Me to the Moon” -NEW! Craig & Sarah Duets - "Autumn Leaves" -NEW! I love working with Craig and Sarah on ArtistWorks. My ukulele playing has really progressed, and it's so much fun! I really enjoy learning from Sarah & Craig. The video lessons are professionally done, clear and informative. They respond to every video exchange, and by watching other folks lesson as well as the responses, you learn so much! Highly recommend ArtistWorks; especially the ukulele portion. easy to work with Craig and Sarah. Always positive and always encouraging. Their teaching techniques are super and easy to follow. Love the convenience of the program, any time and any where! Atistworks has allowed me to take my ukulele playing to the next level, Sarah ans Craig, the teachers, not only provide a step by step approach, but they also give techniques that are possible to learn and improve on every week. Thanks!